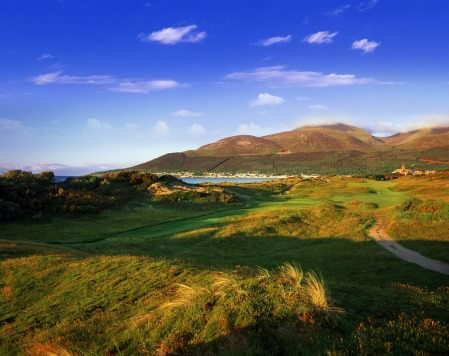 Royal County Down is number one in the 2010 Golf Digest Ireland Top-100 rankings. Royal County Down has regained its spot as Ireland’s top course in the annual Golf Digest Ireland Top 100 ranking. The Co Down links swapped places with Portmarnock, the number one course in 2009, as Royal Portrush rose one place to third and The European Club dropped one to fourth in a ranking compiled by a panel of golf course architects, former amateur internationals and golf administrators. Jack Nicklaus’ Killeen Castle in Co Meath, host venue for next year’s Solheim Cup, is the top new entry for 2010 at 14th followed by the Nick Faldo course at Lough Erne (22nd). Other high ranking new entries include the Old Tom Morris Course at Rosapenna (33rd), the West Course at Powerscourt (38th), Concra Wood in Co Monaghan (39th), The Valley Course at Royal Portrush (44th), Farnham Estate in Co Cavan (48th) and Luttrellstown (49th). Since we started this process of grading courses, it has served to highlight the splendid work clubs throughout the country have been doing to upgrade their facilities. This year, the panel has been modified from 2009 with the addition of some fresh blood to help ensure this massive undertaking got the attention it deserves. Eddie Connaugton, an esteemed agronomist; Kate McCann, an experienced Curtis Cup Player; Valerie Hassett also of the Curtis Cup ; Cecil Whelan, founder of the famously charitable Links Society and a man this magazine voted as one of the Top 50 most influential people in Irish golf; and Ally McIntosh, the course designer and a writer of regular architecture columns in these pages are all new to the panel, but have the kind of expertise in the industry that is indispensable when trying to make these tough decisions. They joined our existing panelists Declan Branigan, agronomist and course-designer; Mark Gannon, a Royal and Ancient selector; Michael McCumiskey, the Secretary of the PGA Irish Region; Garth McGimpsey, a former Walker Cup captain; John Quigley, of the Association of Irish Golf Club Secretaries and, of course, the panel’s chairman: Pádraig O hUiginn. 76 golf clubs wrote to the panel, either to detail various upgrade work that had taken place over the course of the year, or to request a visit. Each one was visited and accessed over a four month period, as was a further list of 29 golf clubs who did not make last year’s rankings but merited another assessment. Over a four month period, these golf clubs were visited and assessed. Once the Top-10 had been decided, the panel then debated what 20 clubs could possibly make it into the 11-20 bracket, and the individual voting process was repeated. The same process was continued throughout the 100 positions. All golf clubs that we were aware of being in receivership, at the time of publication, were not considered in these rankings.